In the early morning hours of Tuesday November 26, 2013, 21-year-old Amber Lynn Gray and her boyfriend were having a disagreement. He had allegedly gone to the store and returned without the cigarettes that she had requested. The pair was also drinking heavily, which caused the altercation to escalate from verbal sparring into a drunken, physical attack. The assault began with Amber picking up a water bottle and hurling it at her beau, striking him in the head. She then proceeded to destroy various items around the apartment. When this failed to get his attention, however, she decided to switch from water to fire...and attack the unmentionables. 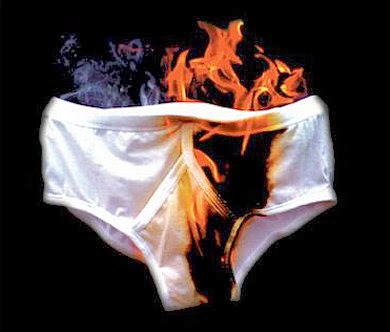 Amber reached into her boyfriend's underwear drawer, pulled out a pair, lit them on fire, and threw them onto the hallway floor. She then left the premises while the poor guy was left to extinguish his burning britches in the bath tub. This act was particularly diabolical on a number of levels. Not only did she destroy a piece of clothing, but she used it to also cause damage to the carpet. If the underwear had skid marks on it (which let's face it, every guy has some brown striped pairs they still use), than the smell is probably still hanging in the air of his home. The police were called and eventually located Amber at a casino, where she was presumably playing craps. She was arrested on a felony charge of arson and a misdemeanor charge of domestic battery. She is currently being held in the Carson City jail on $43,132 bail. To get updates on when new articles or podcasts are published (and occasional random musings) 'Like' the official RamblingBeachCat.com Facebook page. Every time someone does, a man with a crazy girlfriend buys a lock for his underwear drawer.